Setting up a flat fee commission plan where the agent gets a percentage of the deal on all of their transactions is simple. Go to Settings > Commission Plans on the side menu. Click the Add Plan button. Select Flat Fee from the Type of Plan drop down. Enter the percentage that the agent receives on each deal. If the agent gets 80% of the gross commission, enter 80 here. Add a Closing Fee to this plan. 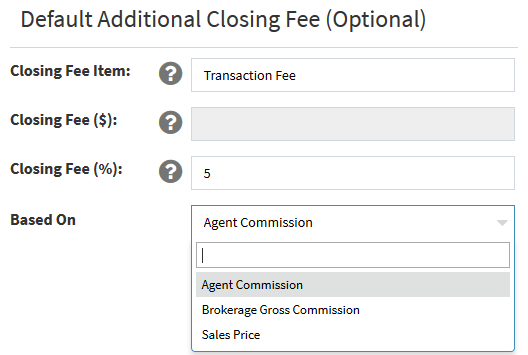 This is a fee that will be deducted after the agent's split with the brokerage and will be applied to every agent who is assigned to this commission plan. For example, if you charge a $200 transaction fee on every deal, you can add that fee here and it will be automatically deducted from the agent's net commission when you create a commission disbursement for this agent. 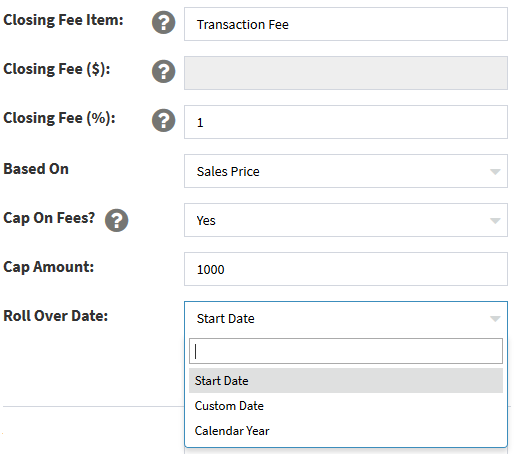 Or if you charge a % of the sales price, gross commission or agent's commission you can add that as well. Next, do you have a cap on those transaction fees that you just added? For example, if you charge 1% of the sales price but only until the agent has paid $1,000, you can set that up by adding the 1% fee based on the sales price, and select Yes to Cap on Fees, and then enter $1,000 in the Cap Amount field and choose when that cap resets by choosing a roll over option.